Many New York seniors who use Medicare Advantage will pay more for both their premiums and they prescriptions starting in January. Recently released national Medicare data show the average cost of premiums for Medicare Advantage will increase by 2% in 2015, according to an analysis by HealthPocket. Statewide, the average premium is up just less than 3 and a quarter percent. In 2014, the average premium in New York for Medicare Advantage was $55.02. In 2015, that figure will go up to $56.80. Overall the average deductible for prescriptions is down nearly 4% across the state, although in Monroe, Ontario, and Wayne Counties-it’s more than doubled. Many upstate counties are in the same boat. 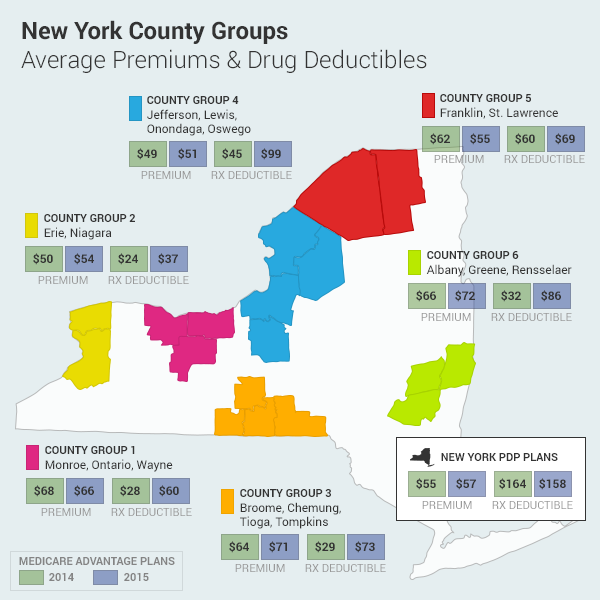 Chemung County has the highest average deductible for prescription drugs in the state-at $118.33. Tioga County has the highest average Medicare Advantage premium-at $80.86. Nationwide, the number of Medicare Advantage plans with zero dollar deductibles has decreased by 19%. A deductible is the yearly amount members pay for their medical services before their care becomes a co-pay with their insurer. Interview with Kevin Coleman, Head of Research & Data at HealthPocket, Inc.